‘Maybe”,fairly sure that work would intervene in the negative, or maybe for my nerves the positive. Then 10 days ago I get an sms, not sure if from Ian or Squash," are you in, decision time!". I was supposed to have been in JHB on the day the sms was sent, but had cancelled and as no Babwe phones have roaming would have only got the sms on Monday, which would have been too late for the trip. I had mixed up the dates and thought the trip was a good 10 days away and not the next Wednesday. It really was decision time so I made the decision as best as I could by passing it on to the FD by asking for the leave, knowing with the on going Meikles saga that there was a greater than a 50% chance of a NO .He said GO .It did seem the stars were lining up and finally I would do the top section of the Falls. My nerves were telling otherwise. The central tenant of the drive up was Ian and Squash tormenting me on the worst sections of the river.7 came up whenever there was a lull in the conversation, more particularly the Temple of Doom, with Ian doubting the ladder nailed to the rock was still there so you’d just rotate if you went in with no way of getting out and no way of anyone getting to you. Really reassuring. Just short of Byos Squash and Ian has their first beer and this theme was taken up from Hwange. I was determined to keep a clear head. That didn’t last as we headed straight to the Boat Club to meet Barry and Tanya,Vanessa,Sid and Cheryl. Brent was in the UK.It was great and even though the river was right there I was soon losing my fears as each beer slipped down. By the end of the night I was bullet proof ,but at 2am I wasn’t . I awoke with a start thinking “I can’t believe I’m doing this!” 4 hours later I was still thinking the same as we got up. 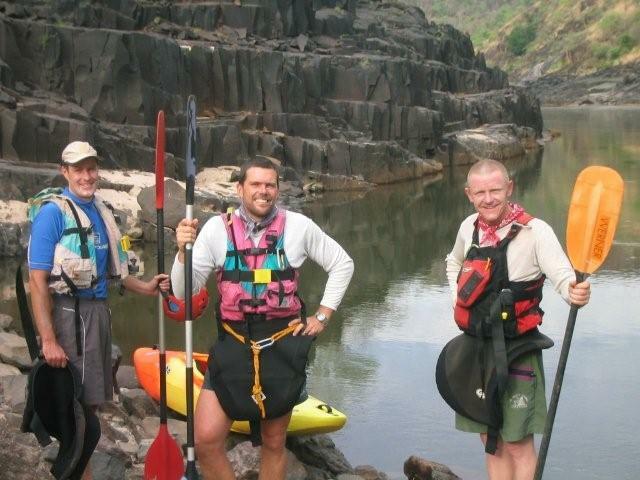 Safpar had one raft and 3 clients-.3 soft locals from Harare, the last people I expected to be on the trip. Maybe they weren’t so soft.By the time we got down to the river it was around 10 and with my nerves and lack of sleep, I felt like I had just crossed 10 times zones non stop and was wired to the moon. The walk down is new and good and rapid 2 looked OK.So did 1,which I thought, for some reason, had a diagonal wave which you had to punch through and if you missed you faced certain death by being swept up against a rock face. The reality was it was pretty straight forward with no diagonal and at this low level the rock face is not an issue. Waiting for the boats took forever as now you just want to get going. It didn’t help with Ian and Squash betting when I’d have my first swim.Ians’ was when I did my first practice roll and Squash’s was in 1.My first roll was fine-the past 2 days hurried rolling in the pool had paid off. I was in one of Squash boats-yes it was too small for him, so I sort of fitted. We went and checked out the minus rapids and the Falls which are stunning and then it was time for 1. 1 was great and so were 2 and 3 and so now it was 4 and the start of the Challenge.Ian and Squash rated 4 and 7 as the worst rapids on the river toswim-9 not being considered. 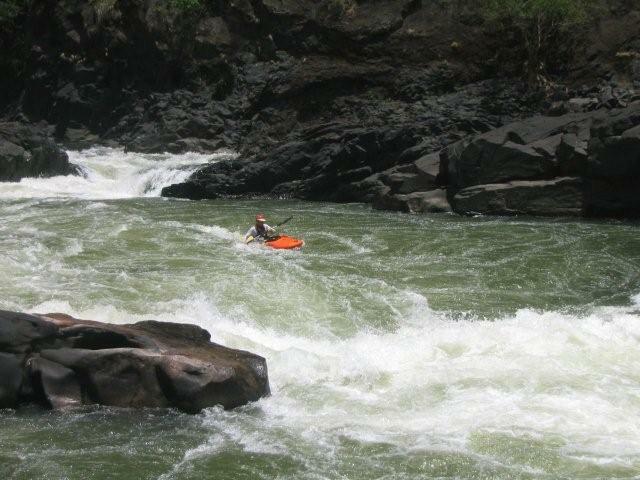 I followed Squash into the eddy above and then through the rapid, pulling as hard as possible away to the left from the wall and the hole at the bottom. I hit the edge of the hole and was flipped and 3 rolls later was up and through. Now 5.Followed Ian down and he soon disappeared into a white out, though I did see the bottom of his boat as I roller coasted through, right side up. Can’t really remember 6, 6.5,but who does with 7 and the Temple of Doom coming up? In we went to 7 through indicator rock on the left and made for the eddy on the right bank where we got out to check the reality coming up. Following Ian and Squash, I fell off a rock backwards and fell 1-2m straight onto another rock. 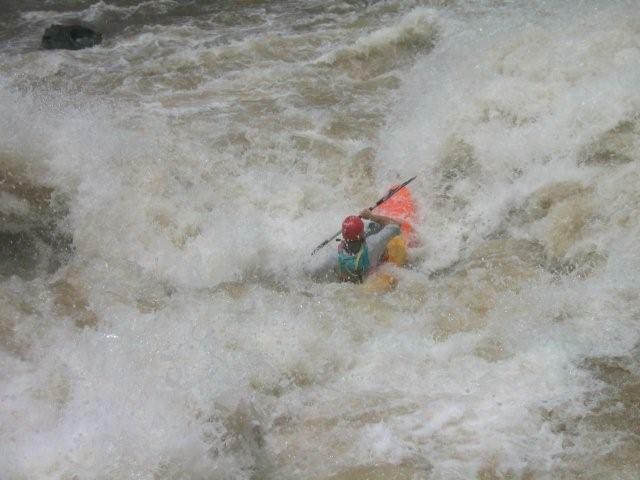 It's amazing how protective a life jacket and helmet are. I was shaken but fine. Not the best preparation for the crease and land of giants. Squash went through while Ian and I watched. Getting the line, I then followed Ian, out the eddy across the current, onto the green highway, down across the diagonals and through the crease, bracing like mad, and then into the land of the giants, but it was a brace too far and I was over, but not out, as I rolled and was through 7 unscathed !. Now only 8 and that was a gas. According to both Ian and Squash I had to do a “Star Trek", going river left. Somehow the night before I had found out that is not what you do, and knew that not having swum was frustrating their humour. 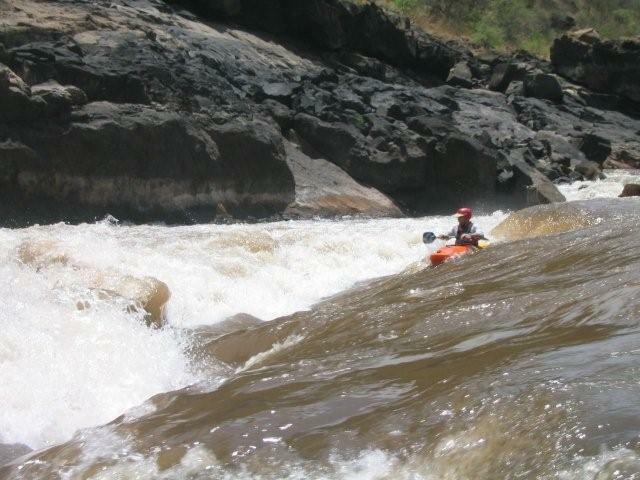 I said no “right” and we settled on straight and next thing I was dropping into a wall of white water and was over but after a couple of rolls up and through the rapid. It was then that Squash and Ian heard the first sound from me since the start of rapid 1, as I finally shouted with satisfaction. We all walked 9 and it was their that Squash picked up his first fine when he lost his bung, causing 20 minutes of searching, which resulted only in Ian finding an Zambian’s slip slop which was cut up as a subsitute.Ian had the first with a fine for being too fat as he split his pants, at 1, getting into his boat. At lunch which was needed like never before and hats off to Safpar for the spread, Barry joined us and the 3 locals in the raft. All too soon 11 was before us and then it was over. I was told I had to surf 12 B,but didn’t and for my insolence I went over at the top of 13 and instead of hanging in I swam. Too wired and exhausted. So now I had my fine. 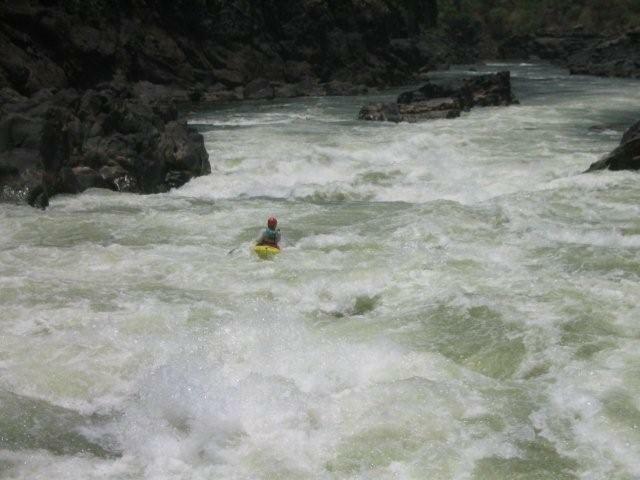 The rest of the rapids were great and really enjoyed 18-missed the hole. Few rafts flipped there ,by then we had caught up with bulk of the days rafts -a paltry 5. Got down to the SafPar take out and overnight stop, around 23.Soon we were mellowing out with Scotch and ice cold water and my transatlantic nerves thawed away. Barry was a gas regaling us with tales of Vic Falls 1990-2000.The highlight was Hungry’s bachelors and the bucket of dope chocolate and the village. There were so many stories that soon 2 and half bottle of scotch were a thing of the past. In truth the batting average was: Andy ¼.Ian and Barry ½ and Squash ¾.But then Squash deserved the extras for cooking the pasta and whatever tins he could find to throw in. Great meal. Then it was Friday and as I came out my tent I saw Ian and Barry had managed at least to get a mattress to lie on as the tents had proved just too far. A splendid breakfast of pineapple chunks, couple of biscuits and a breakfast bar was had and then cheers to Barry. The warm up to Open Season was great-wave trains. I tried to get out of doing OP,but sense prevailed when the practicalities of walking presented themselves. I cocked up the line and was lucky. 1 down 2 to go. Then through the narrows. Not something I appreciated as I am not used to boils and all that stuff. 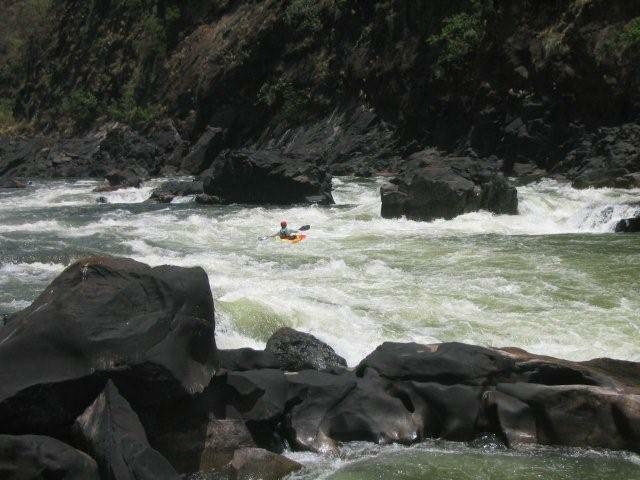 Squash almost swam after going over in a rapid in the narrows and then getting worked by the wall and the boils. Not a pretty sight but he came up on the 4th go. We stopped for tea-a tin of baked beans and water. I was stuffed-a lot for this old body to handle. 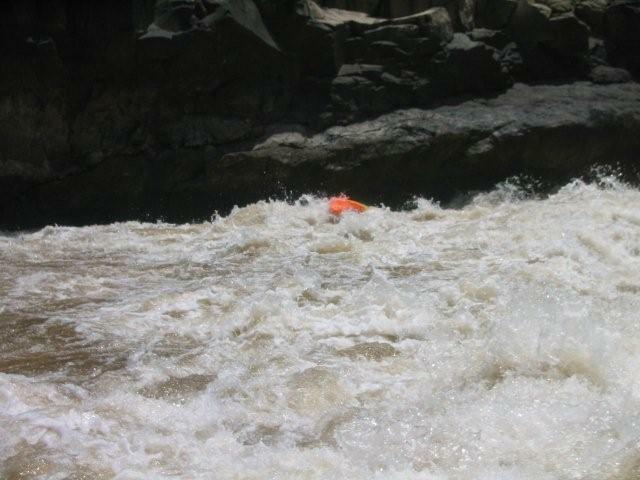 Leading up to Gossamer Falls, in a small rapid with a left hand 90 degree turn I became trapped against a rock. Somehow I let go of my paddle and tried flailing the water, I guess,in a way of trying to upright myself. Clearly it didn’t work as I swam. Surprisingly, just after this Squash swam. I not sure how, boils I think, as I was upside down in a whirlpool. This I didn’t know as Ian told me afterwards. If I had I would have freaked out. I thought I was getting worked in a hole or something and just rolled a couple of times until I came up. At GF I did a sneak run on the left as I had no wish to go over in the stopper at the top and end up getting worked against the rock wall. It wasn’t big but the stopper looked like it could fight above its weight. On his 2nd go Squash was worked in the stopper and swam! Straight after GF it was Upper Moyemba.I had said this is where I can walk. I had also said that at GF and OP ! But UM looked OK and the walk looked impossible as I was feeling doubly stuffed and it was baking hot. So I was given the honours. Down the middle on the left,. over at the bottom and then the rapid just righted me, but just for a gas as it pulled me back and flipped me back over and then it was up to me. Rolled and waited for the others. Again Squash swam and like the other times I was nowhere near to help. Lower Moyemba is right there and Ian never having walked it was looking to do it. By now the sky was dark and lightening was snaking down and crashing into the hills on the other side of the river and things looked very Gotterdamming (sic).Just needed some Wagner.Ian was hopping around in the water just above the edge of the water fall which is the rapid and it’s high. Squash I portaging the boats across the black basalt to lower them down to the river. Then the heavens opened and horizontal rain swept the rocks and Ian headed our way. He had decided to walk and I was glad as if it had gone wrong there was not a lot we could do to help. By now I was weak and had a few shivers. Nerves and maybe heat stroke? Anyway the dam site was close. 10 minutes after put in we were there. I was glad as I was aching in places unaccustomed to exercise and was getting more and more tired. At the washed out road coming in we got out. I asked if we needed to carry the boats out and was told yes. I knew I’d struggle. The others just set off . I knew they had had enough of this handbrake for the day.1/4 of the way up and after the 2nd dump I left the boat and staggered my way up on my paddle.3/4 of the way up and about an hour, if not more, behind Ian and Squash I met a porter and waved an arm in the general direction of the boat. The intention had been to go down and help, but by now I was struggling to get my self up. I did and collapsed next to Ian and Squash and then onto the truck. By then the runs had started and all energy had left my body. The 2 hour drive on a very bumpy dirt road seemed a lot longer. Brent was back and Ian,Squash,Brent and Vanessa headed for the Boat Club and I for bed. We left at 7 the next day. I drove for the first 80ks as Ian,Squash,Van and Brent had met Jack D when they had got back. So 20ks before Hwange we changed drivers and I had my first session in the thorn bushes.9 hours later I had my last at 12 Garden Lane. 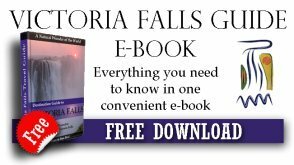 It was the Full Monty –diarrhoea and vomiting. The most colourful episode was in Byo when the others stopped for pizza and I for other things. Like a white hobbo recovering from a benda, I staggered into Chicken Inn asking for the loo,unshaven sunburnt with my pale face shining under a sheen of sweat and my hair on end. I was told upstairs at Creamy Inn.I hastily staggered out and made it as far as the dustbin outside Creamy Inn. Luckily it was a tall green plastic one with a lid. I did make it upstairs for the other stage. The final word has to go to Nyami Nyami who showed that you may get away with 2 swims, but the river always wins, even when you get to Harare.